I listened to 1932 again. It threw me back to 1966 on my father’s farm and a crop failure. I love how you have given a voice to something that sat in the back of my mind for years. It is a memory that is not sad. It is just the way the world worked. All the best on your website launch. I enjoyed the show last Friday night, you and Harmony together in Little Rock, bringing Arkansas history alive in words and music. Y’all are a treasure. 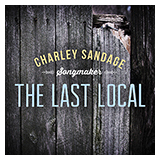 And I’m enjoying this new CD “The Last Local”. Keep up the great work.